These hobby horses, or "stick ponies", are perfect for "horsing around". 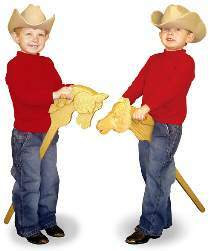 They will provide hours of fun for your little cowboy or cowgirl. All parts can be cut from 3/4" stock. Plan includes FULL SIZE patters for both projects. Projects measure approximately 36" long. Order one dowel (enough for two handles) separately below.